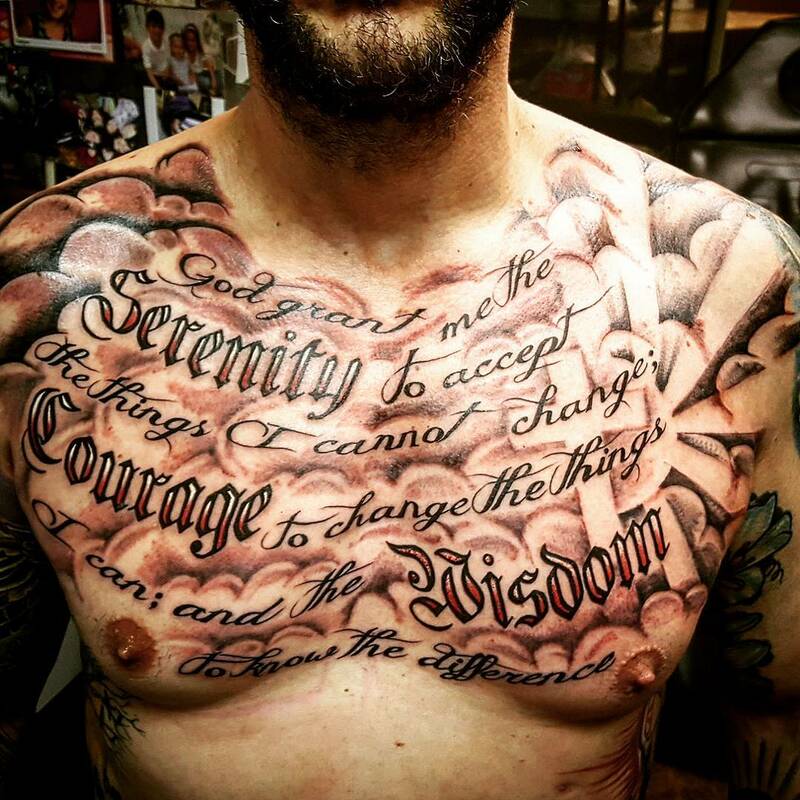 A serenity prayer tattoo is the purest body marking that you can have. It looks stylish and also ensures that you always remember God, and this is regardless of whether you are a secularist or Christian. Many self-help groups such as those for people struggling with alcoholism have always used these tattoos for encouragement. This mantra has about 27 words depending on how you write it but its meaning is very deep and looking at this tattoo every morning is enough to encourage you to face all the challenges that the day may bring. What Does the Tattoo Mean? The serenity prayer is close to a century old, and most historians attribute it to Reinhold Niebuhr, a famous American theologian. And this is because the earliest known reference to the prayer was in 1932 in the diary of one of his students who attributes the prayer to Niebuhr. The student’s name was Crane Wygal and in the years that followed he also had several articles in newspapers and talks where he used the prayer widely. 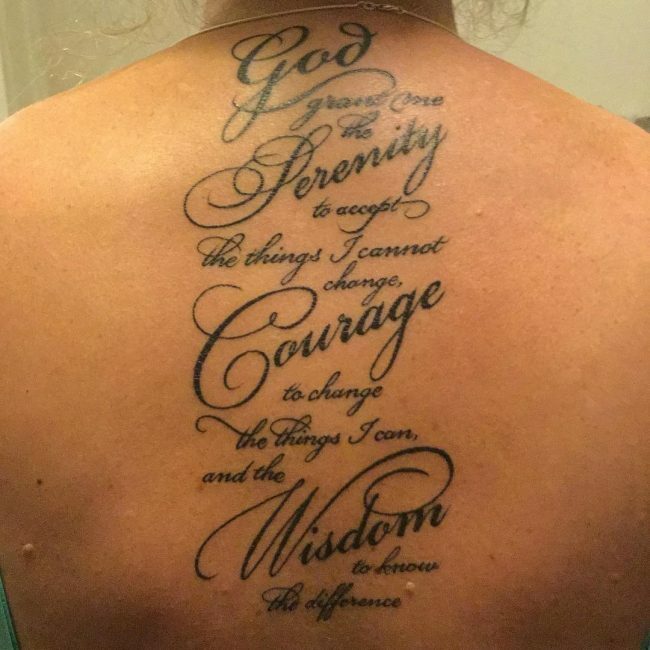 Niebuhr himself was not proficient in writing, and so he focused on teaching but in 1951 he published the final version of the prayer, and it is what people have today as tattoos. However, his students like Wygal played a vital role in spreading the prayer and historians give more credit to them for its popularity than Niebuhr who came up with it. 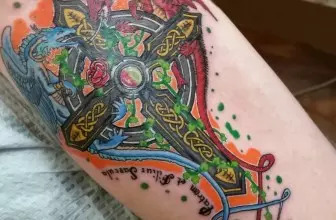 It is hard to figure out when people started drawing the prayer on their body, but it will be correct to say that this is more recent because phrase tattoo only became popular a few decades ago. And with the many struggles that people go through today whether at a personal level or as a society the words in the phrase are very relevant and so more and more people are getting it. This phrase is self-explanatory, and this is one of the things that make it a favorite of many. The four words that stand out in the sentence are God, Serenity, Courage, and Wisdom. And so Christians and other people that have faith in God will have it as a sign of conviction. Others will highlight the word serenity with a bold font to show that this is what they value most on their tattoo because they would wish to live a peaceful life free from all the troubles of the world. The same goes for courage and wisdom depending on why you have the tattoo. 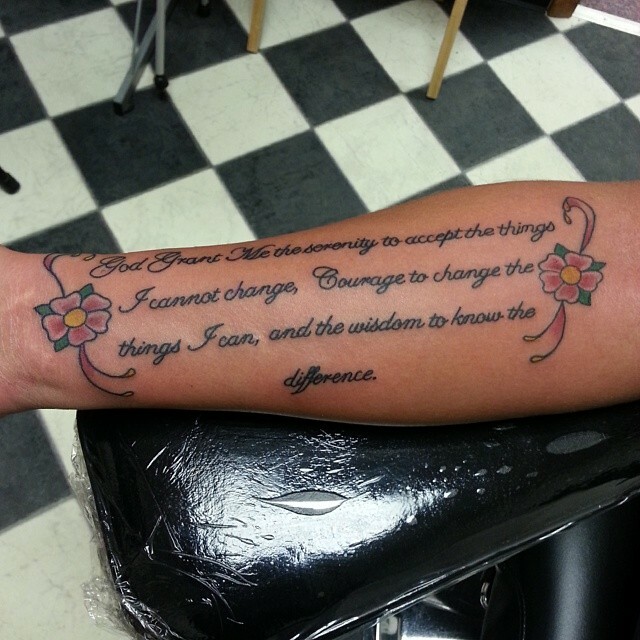 Alcoholics Anonymous also adopt the serenity prayer tattoo where recovering alcoholics will have it for encouragement. If you are recovering from alcoholism or would wish to do so, you can have this body marking to show that you are victorious over the addiction. Christians will usually recite this famous mantra to evoke understanding and patience and so you can also have it on your body for the same purpose. Other common meanings that most tattoo enthusiasts associate with this phrase include grace, strength, and determination. 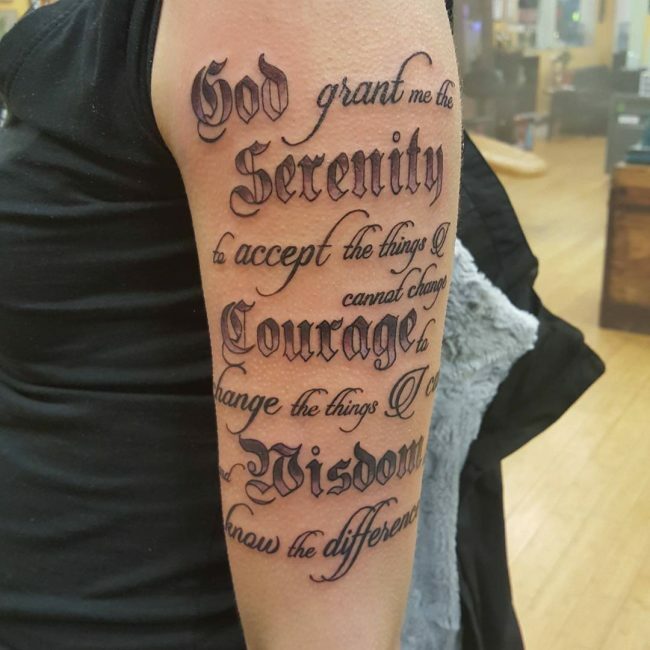 Just like with most other phrase tattoos the variations of the serenity prayer tattoo will vary according to the kind of font an artist uses. There are dozens of fonts available and so what you choose is what makes your phrase look different from others. Apart from this, you can also have it in a different language such as Arabic or Chinese instead of the traditional English. 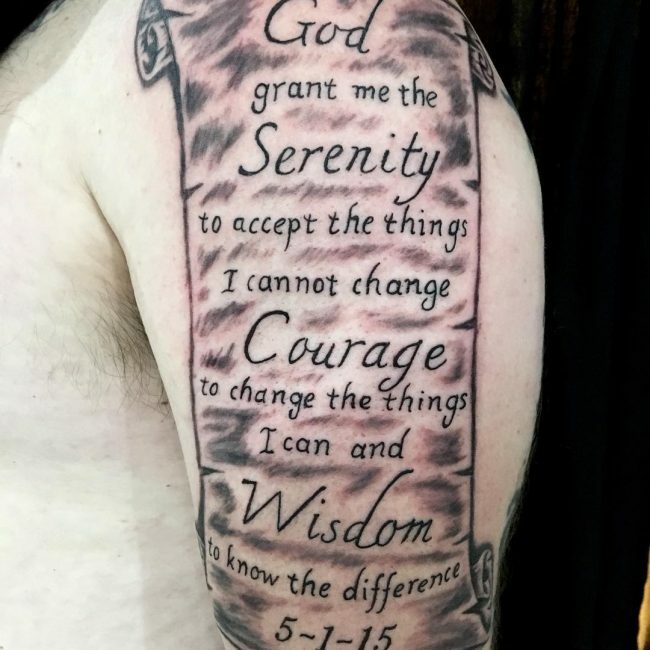 Having your serenity prayer in other languages will make it look unique because of the difference in calligraphy and alphabet. Another common type of this body marking entails drawing only the three most important words that are Serenity, Courage, and Wisdom. You can have them with a large font and in a straight line or get a little creative and use them to form a triangle to give your tattoo a deeper meaning. Other types of this tattoo will entail adding other images or symbols. The most common of them all is the scroll of courage and in this style, the design involves drawing the phrase on an old scroll to show the wisdom behind the prayer. You can also combine the prayer with praying hands, rosary or a cross and this is more so for Roman Catholic Christians. Some other designs will have small birds to symbolize freedom and also have an angel or some angel wings around the tattoo. The fact that this is a phrase tattoo means that you can combine it with almost any symbol that you wish. But, it is important to ensure that you understand the meaning of the body marking that you will end up creating. 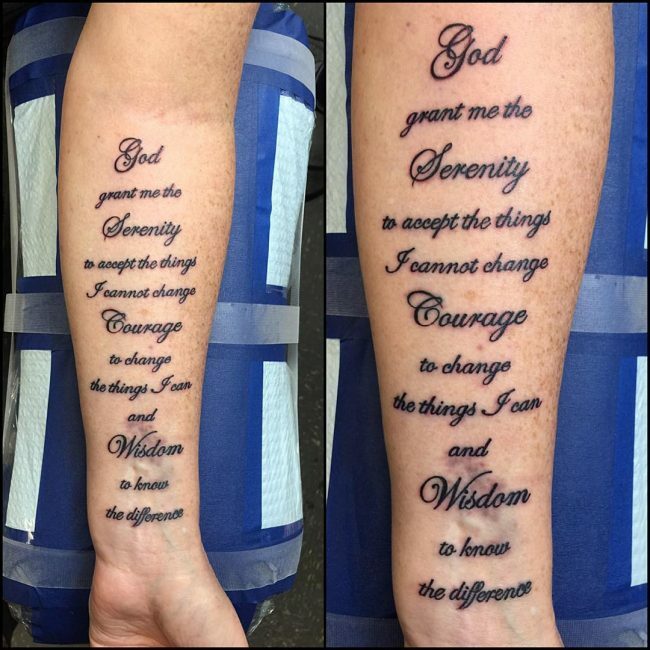 The serenity prayer tattoo has more than two dozen words, and this makes it quite a long phrase. Most people have a hard time placing a long phrase on their body, and this is more so if you want to have all the words clearly. However, if you have a skilled artist, he or she can be able to place it anywhere that you wish. But, the best place to have the serenity prayer is on your arm because you will be able to see it anytime and every time you want. The words in this tattoo are for encouragement and so the best place to have them is where you can see them. There are still many other placement options because not every person likes to have his or her hands inked. Another common place to have the phrase is on the side just below the breast. There is enough space here, and so you can be able to have the words as big as you wish and if you cannot read them by looking down you can use a mirror. The back is also a good placement area because of the availability of enough space and also because back tattoos look very cool. It is also not uncommon to have this phrase on your leg, wrist and even at the back side of your neck. 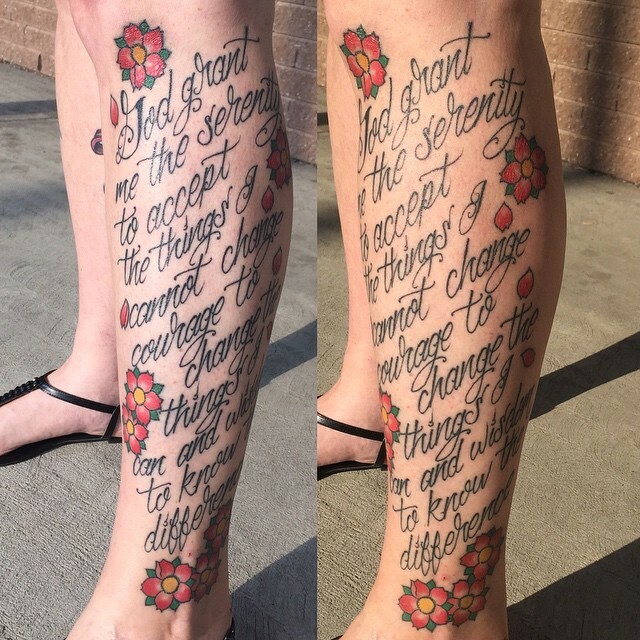 A serenity prayer tattoo will have an immense effect in your life because you will always have some encouraging words that you can look at when you are feeling down and sad. Instead of just having some images without any meaning the serenity prayer is perfect for you as it will help you face your challenges in life. And the good thing is that these tattoos also look fashionable and attractive if you have them in a nice font.